Today, I'll be reviewing two products from www.bornprettystore.com, as well as showing some nail art that I've created using the items! The iridescent studs are called Shimmer Grid Rhinestoned Leaf Patterned 3D Nail Art Sticker. There are 24 pieces here, two of each color. They are very iridescent- so pretty, and constantly change with the light! The fan brush is simply Candy colored Fan-shaped Nail Art Brush. I decided to try some simple, abstract fan brush stripey nail art, since I'd never tried that technique before. As you can see, my stripes didn't come out super cleanly, so I am calling this mani "distressed fan brush nail art" (see what I did there?). There seems to be a learning curve in using the fan brush (at least for me). You need to be able to pick up the correct amount of polish and use adequate pressure, but not too much, so that the bristles glide across the nail. It also helps to wet the brush slightly so the bristles stick together and form little gaps. This was my first time, though, and I'm relatively pleased with the result. As far as the fan brush goes, it performed well! Any messiness must be attributed to my noob attempt at this style of nail art! The handle is nice and long, and the ferrule is securely attached. The bristles are a good stiffness- they bend a little, but hold their shape, even after being washed. As you can see above the leaf studs are massive! These are very, very three-dimensional. I'm not a frequent 3D nail embellishment-wearer, but I have to say these were super fun and eye-catching. I really loved that there were so many colors to choose from. I used super glue to adhere them on top of my design. They stayed for about 24 hours this way, which was longer than I was expecting. I lost one while trying to run my fingers through my hair, and the other one I removed prior to doing my next manicure. Because these nail studs are so large, they don't fit to the curvature of a natural nail, so you can't expect to use topcoat over them, and you probably do need something as strong as nail or super glue to adhere them. I do think they'd make awesome centerpieces for some totally overboard 3D, jewel-encrusted nails, if you're into that sort of thing. The base color here, which barely shows, is OPI- Tickle My France-y, and the polishes used for the brushed-on lines are Models Own- Pink Punch, China Glaze- Sun Worshiper (it's spelled with one 'p' on the label- gah! ), and Morgan Taylor- Take Me To Your Tribe. I think next time, I'll go with a brighter/ lighter neutral base...something like OPI- Don't Bossa Nova Me Around, so that the overlaid colors don't become as muddied. PS: Here is a 10% discount coupon code for Born Pretty Store: HFX31. 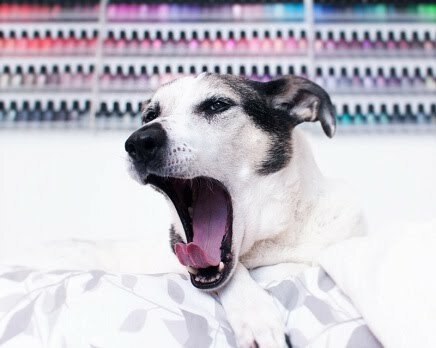 Go getchu some fancy nail art stuffs! What do you think of these nail studs? Have you tried fan brush art before? Any tips? Disclosure: Products in this post were provided for honest review. All opinions are my own! Love how colorful these turned out. That design you got with the fan brush turned out amazing! Those leaf studs look they there glowing from within too. Ooh, super pretty! I've never seen these rhinestones before, they're awesome. I love this! I have tried the fan brush before but I didn't get it to work so I honestly forgot about it. Now I'll try this again, because I really like how your manicure turned out. This is SO PRETTY!! Heck, I've never done a fan brush nail art myself but I would say that you nailed it had you never said it didn't turn out right! I think you created a new nail art trend with the distressed look! I love those leaf studs, especially the ones that look multichrome. They are really, really pretty in person- just huge, though! Yea, it definitely didn't come out perfectly, but still cool! Ah, THANK YOU! They are all kind of multichrome or iridescent- really beautiful in person!